“When I think about being PREPPY, it conjures up memories of my uniform at an all-girls school in the Philippines where I grew up. “While wearing a uniform to school every day was certainly easy and convenient, I remember that I counted down the days to graduation. Graduation meant liberation from a uniform I’d worn for 12 years and I was ready to be on my own to experiment with my own style. •To translate preppy into the workplace, the fit and flare dress and cardigan combo is always a winner. Wear this fool-proof ensemble with your favorite pumps and don’t forget your pearls! •For a more casual work environment, layer a chambray shirt under a fun printed sweater. Dark wash skinny jeans and printed loafers make this a comfortable yet polished outfit. •To incorporate some prep into your casual, everyday outfits this season, pair a simple striped shirt with white jeans and a navy blazer. For a fun pop of color, throw on a pair of bright ballet flats to finish this easy, chic look. •For a spring/summer jaunt to Palm Beach or Nantucket, opt for a pair of seersucker or colored chino shorts with a simple white tank and a chambray button down. Don’t forget your aviators, Sperry Top Siders and a Panama hat for a day of exploring around town. A vibrant tunic can be paired with white skinny jeans and can double as a swimsuit cover-up! 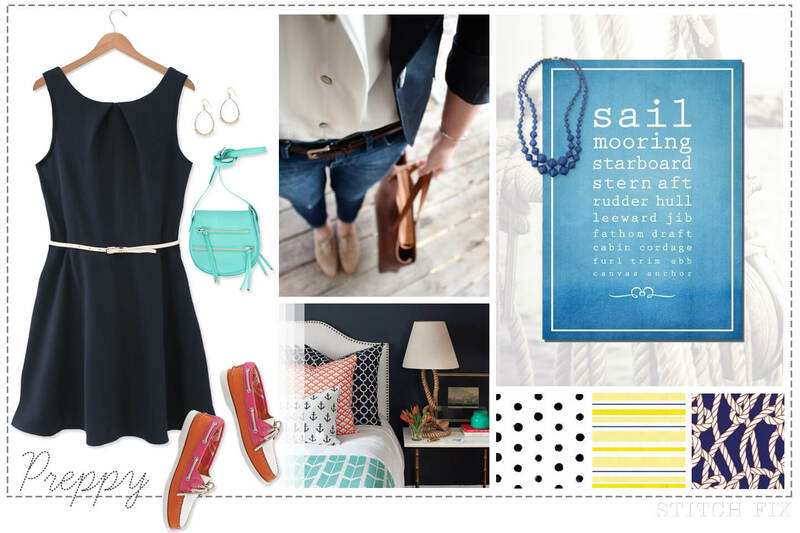 Read our preppy style guide for more tips on this look. If you want to incorporate a touch of prep into your wardrobe, just let your Stylist know when you schedule your next Fix!